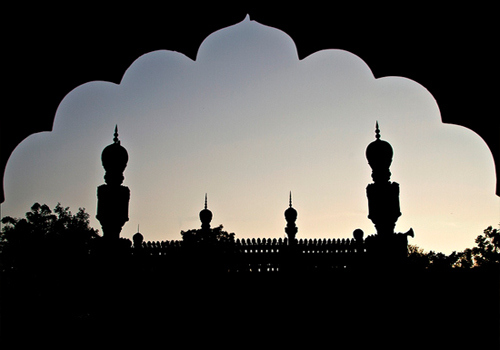 Spread across an area of 30-40 acres, the origin of Paigah Tombs can be traced back to late 18th century. 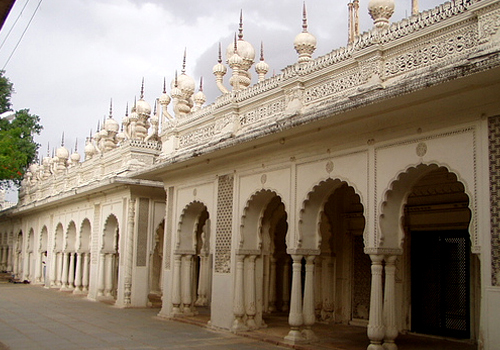 One of the popular sightseeing places of Hyderabad, Paigah Tombs are known for their architectural excellence. One of the best examples of Indo Saracenic architecture, the tombs presents a beautiful blend of Asaf Jah and Rajputani style of architecture. Built of white marble, Paigah tombs captivate visitors with intricately designed interiors. A worth visiting site, location of Paigah Tombs is close to Charminar, another popular tourism place to visit in Hyderabad. These are situated in Santosh nagar. Paigahs who married daughters of the Nizams were the highest ranking nobles in princely state of Hyderabad, after the family of Nizams. Paigahs were the only noble family who were permitted by the Sultan to have their private army. Paigah Tombs have been decorated with exceptionally crafted geometrical patterns and carefully created designs. These tombs have been skilfully carved and their inlaid mosaic tile work is breathtaking. The famous ‘Jali’ work makes it even more attractive. Each Tomb has been designed differently, ensuing a unique style and design. Each Paigah tomb is consisted of elaborate covering and marble fences which are adorned with exemplary geometrical and floral designs. However, if you observe carefully, you will be able to notice the designing difference between the tombs. The semi circular arches, representing Indian architecture, are also seen here. At the entrance of the tombs, there is an iron tablet with inscriptions about Paigah lineage. Chants and tributes have also been imprinted on epitaphs. Another key feature of these tombs is that they demonstrate the royal family tree. The Paigah Nobility was founded by Abdul Fateh Khan Tegh Jung who had served the second Nizam. The title of ‘Shams-ul-umra’ which means the sun amongst the masses was bestowed to him by the Nizam. Abdul Fateh Khan Tegh Jung was later buried at the entrance of the complex in the year of 1786. The tomb of Teng Jung presents a mesmerising architecture with exquisite lattice work with a massive canopy. It was later renovated by his son Amir E Kabir. It came to be known as Paigah Tombs which became the last resting abode of the other members of the family as well. Paigah tombs have graves of many members from the family. These members also had primary nobility in the court of Nizams. Some of the tombs are of Sultan-ul-Mulk, Shams-ul-Umra, Zaheer yar Jung, Sir Viqar-ul-Umara, Sir Khursheed Jah, Asman Jah and others. Paigah tombs beauty is nothing less than a wonder, their elaborate interiors with meticulously decorated walls, adorned with lattice work and a wide array of exotic designs, their fascinating architecture and association with the history of Hyderabad and royal period. These are just a few reasons to visit Paigah tombs. You can visit these tombs on all days, except on Fridays. To visit Paigah tombs, the timings are from 10 am to 5 pm. I went there without knowing much. After reaching there I got to know a lot. Paigah tombs are one of the important parts of Hyderabad history. Paigahs were relatives on Nizams, and apparently after nizams, they were the most important royal family. They look extremely beautiful. The place was peaceful as well. Although i found little difficulty in finding exact location of Paigah tombs, I am really glad that i went and saw these. We just couldn’t find the Paigah Tombs location, it is very difficult to find the route! Tombs are beautiful but not well maintained, which was disappointing. We thought at least if we can get a guide it will be easier to know about this historical building but our bad luck we couldn’t even get a guide! Had a disappointing experience at Paigah tombs, hope they can restore it and make it a better tourist place. Paigah tombs have amazing architecture and preserved in a good way. It was amazing to see how even the graves of royals were created with so much care, there is beautifully done carvings, walls are decorated with floral designs, there is jali work too. It is spectacular. I went to paigah tombs few months back, these are tombs of paigah family, nizams’ daughters were married into this family. Its architecture is impressive; it is combination of both Persian and Rajasthani style of architecture. The work on the walls and tombs is especially attractive, the designs are very complex, huge canopy, jail work, decorated wall. There are inscriptions written on epitaphs as well, it tells you about the tombs and royal family. Paigah tombs are not very popular, which is why i missed it on my first trip to Hyderabad. But this time I made it a point to go n see this place. It was little difficult to reach there but it was worth the trouble. These tombs are mesmerising. In fact I liked it way more than Qutub Shahi tombs. Timings of these tombs for viewing from 10 to 5 pm. I recommend it to everyone. If you are planning to visit, don’t start in evening, first of all paiagh tombs timings are from 10- 5pm, second thing its location is not very easy to find so it will take time for you to actually find this place and go. So better to start early so that you get at least two hours to see these tombs.